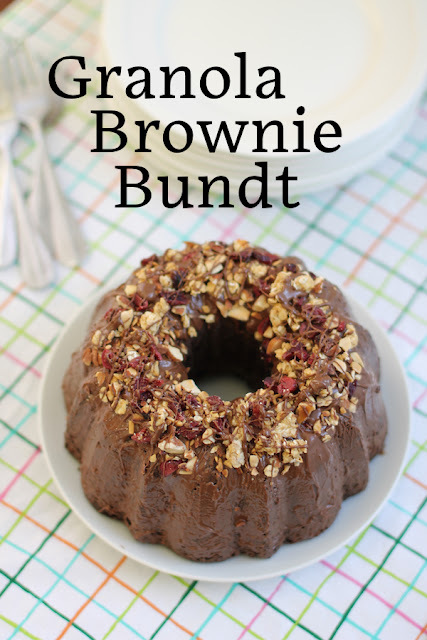 When you are looking for a dessert you can also eat for breakfast, consider this granola brownie Bundt! It’s full of good stuff like dried cranberries, toasted almonds and crunchy granola, in a thick brownie batter. My favorite granola used to be available here in Dubai before my nearby supermarket was bought out by another big chain. Unlike my other favorite cereal (Post Spoon-size Honey Nut Shredded Wheat) which has been discontinued, the Quaker granola is still available in two places I travel to regularly. So, depending on baggage allowance, I usually come home with two or three boxes. The cardboard part goes in the recycle bin and the bags of cereal inside get popped in the deep freezer so the almonds won’t turn rancid. The granola stays fresh for months, perfect no matter how long it takes me to eat it all. Since we found out we were moving, I’ve been trying to eat it more often but I still have a bag and a quarter to get through and only a couple of weeks left in Dubai. 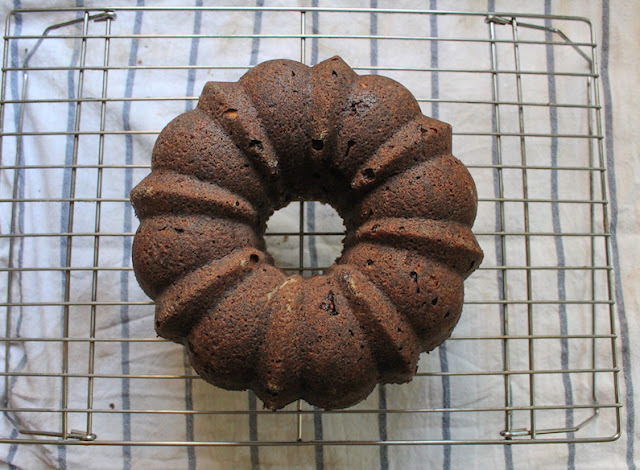 Fortunately my efforts to use up the contents of my freezer and cupboards were aided by our Bundt Bakers’ host, Felice of All That's Left Are The Crumbs. She chose Breakfast Cereals as our theme/ingredient of choice. 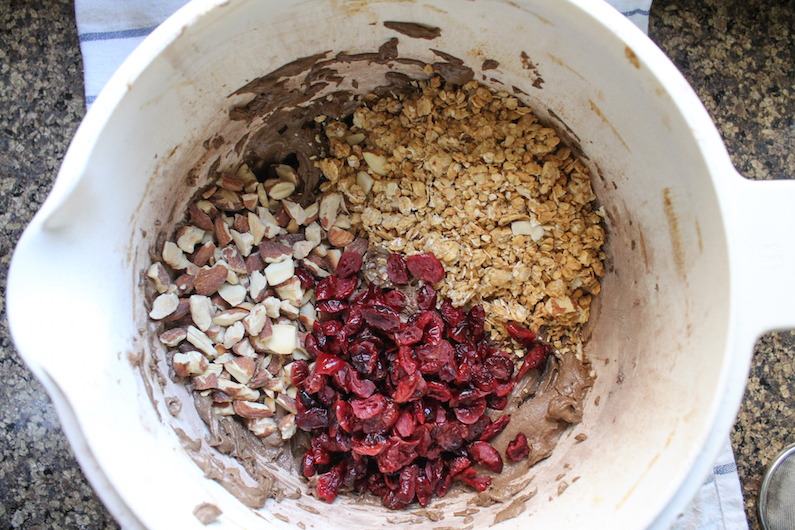 Along with the granola, I used dried cranberries and almonds, also from the freezer. It was a good day. 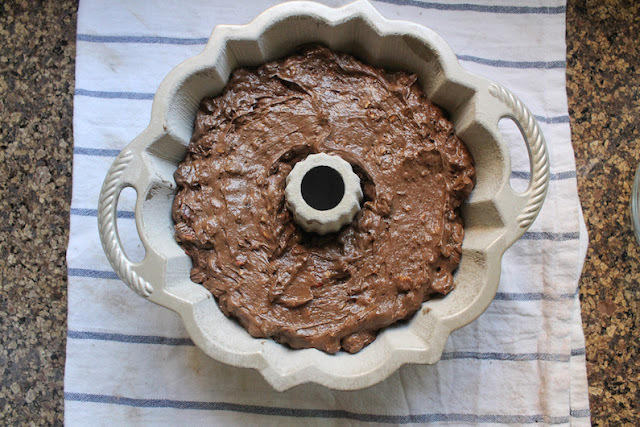 I adapted this recipe from one on the King Arthur flour website for brownie bars kingarthurflour.com/recipes/granola-brownie-bars-recipe and baked it in a 6-cup Bundt pan. Preheat the oven to 325°F and 163°C. Prepare your 6-cup Bundt pan by buttering and flouring it. 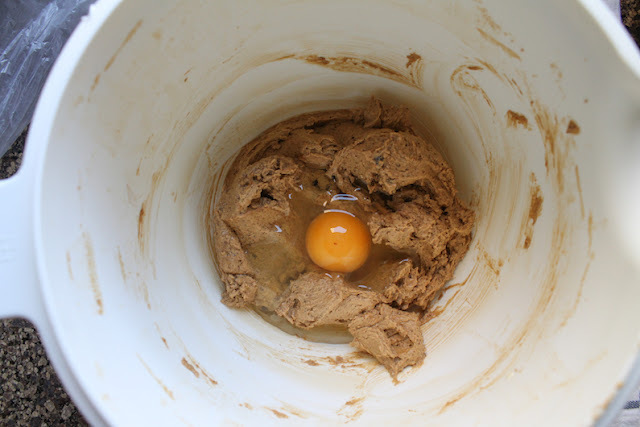 Measure your flour, cocoa, baking powder, baking soda and salt into a bowl and set it aside. 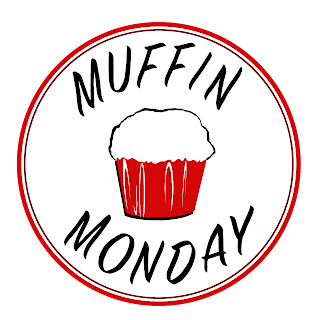 In another large mixing bowl, use a mixer or electric beater to beat together the butter and sugar until they are fluffy. Add the first egg and beat well. 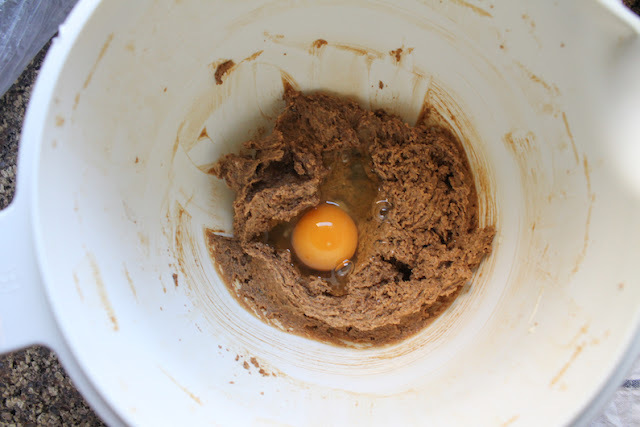 Add the second egg and beat well again. Pour in the vanilla and beat again. Use a flour sifter or strainer to sift half of the dry ingredients into the batter. 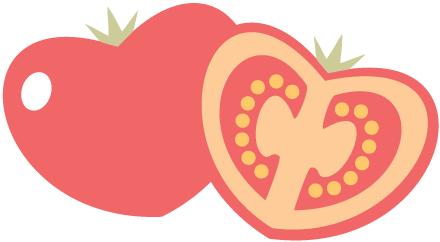 Beat well to combine. 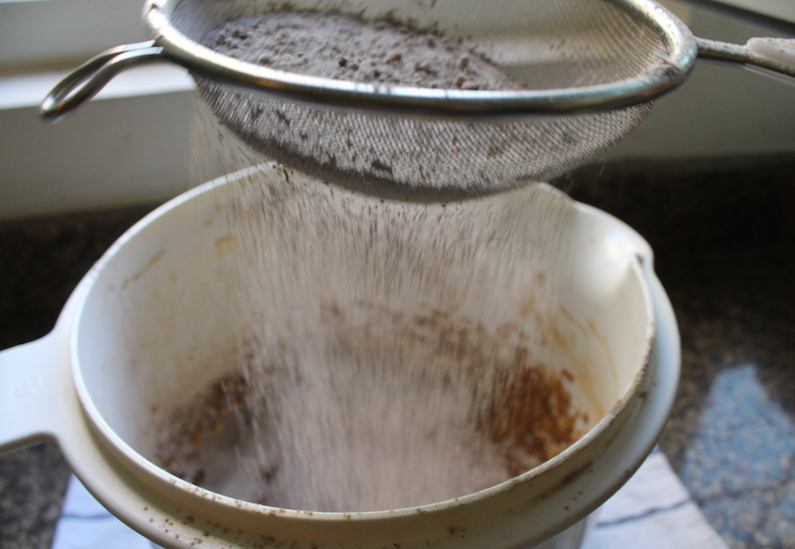 Sift the other half in and beat well again. Fold in the granola, dried cranberries and toasted chopped almonds. Spoon the thick batter into your prepared Bundt pan. 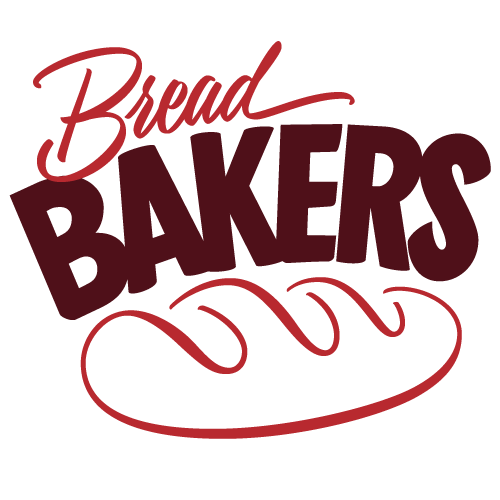 Bake in the preheated oven for 40-45 minutes. Leave to cool in the pan for about 10 minutes, then turn the brownie Bundt out onto a wire rack to cool completely. 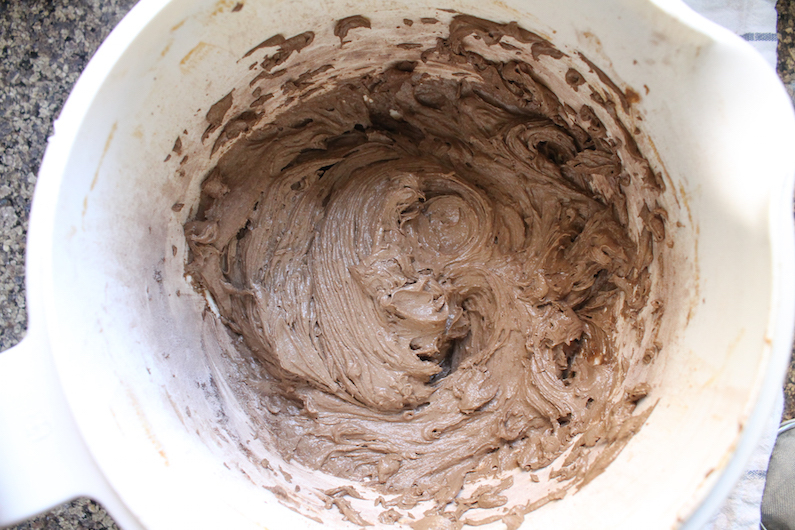 After it was cool, I wanted to decorate mine so I warmed a few tablespoons of Nutella with a quick couple of zaps in the microwave, then used a pastry brush to apply it to the Bundt. 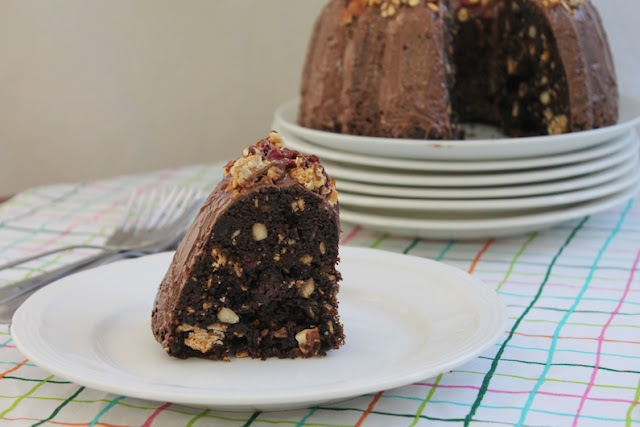 I drizzled some on the top of the cake and then sprinkled the top with almonds, cranberries and granola. 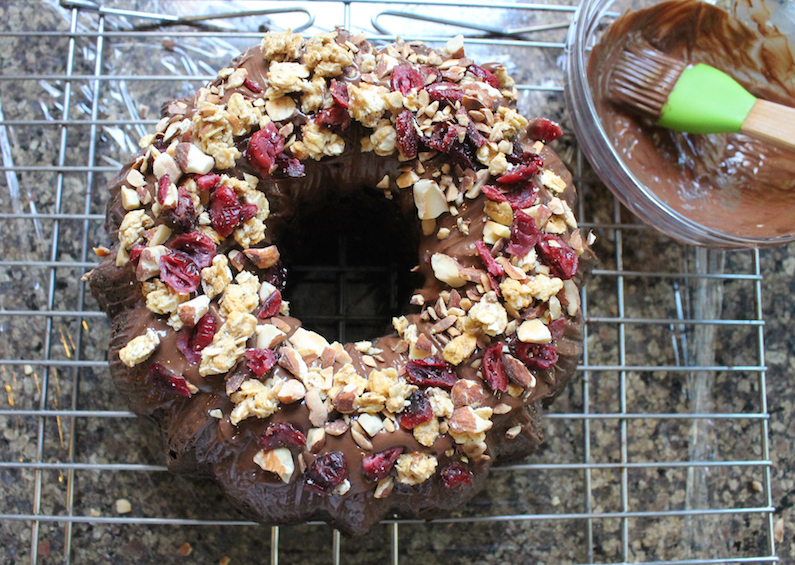 You can, of course, eat this granola brownie Bundt plain as well. Many thanks to this month's host, Felice of All That's Left Are The Crumbs for the great theme and her behind the scenes work. 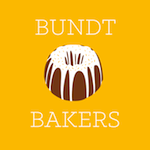 Check out all the fun Breakfast Cereal Bundts we've baked for you today! 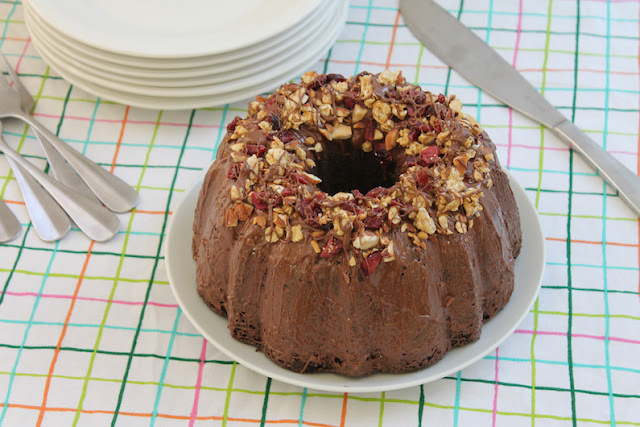 Pin this Granola Brownie Bundt!